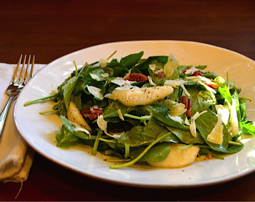 Wild Arugula Pear Salad - A recipe from Savor California, the online showcase for extraordinary gourmet foods and beverages from California. Whisk the mustard, honey, Kokomo Verjus, olive oil, and shallot in a bowl. Add the sliced pear, walnuts, and wild arugula and mix to coat. Season with salt and pepper, and top with shaved parmesan.